I think the majority of recipes I’ll end up sharing with you require 15 minutes or less of actual hands-on work. With three kids, that’s how I roll. Mostly because I don’t have time to roll any other way. This egg bake took me less than 10 minutes to put together. There are three basic elements: hash browns, eggs, and cheese. Everything else can be manipulated to your liking. You can season the hash browns spicy or salty, add diced vegetables or meats, and even add a crumble on top (I like using Grape Nuts cereal because they’re super healthy and give a satisfying crunch). You can do whatever you want/like/have time for/have in your fridge. The version I’m posting is what I made for dinner last night. This dish is also great for breakfast, and it can be made the night before. Just refrigerate it overnight, then let it sit on the counter for about 40 minutes (so the dish can warm up) before you pop it in the oven. It’s also easy to double and feed a crowd. I’d say each batch would feed 6 adults (more if you have extra side dishes). This version happens to be vegetarian as well. These are my big boys, J and Z, enjoying some bacon and a banana while they wait for me to dish out the egg bake. They decided to eat the main dish by mashing it up and putting ketchup all over it. Then they pretended to be zombies eating bloody brains. Yep. Never a dull moment… I’ll have to remember to make this for Halloween. 1. Preheat convection oven to 375° (400° for standard oven). 2.Thaw hash browns in a glass bowl in the microwave for 4 minutes on 80% power. 3. Meanwhile, whisk eggs, milk, and sir cream together in a medium bowl. Season to taste with garlic powder, onion powder, Italian seasoning, salt, and pepper. 4. Grease a 2 quart baking dish. 5. Spread hash browns over bottom of baking dish. Sprinkle to taste with seasoning salt. 6. Throw down a layer of frozen corn, then pour your egg mixture over all of it. 7. Sprinkle with cheese and Grape Nuts. 8. Bake for about 30 minutes until golden brown on sides and bottom. Note: The milk and sour cream can be replaced with 3/4 c of water. It will not be as rich or moist. It will turn out light and fluffy, and it’ll save you some calories. Just depends what you’re going for. You could also leave off the cheese if you need it to be dairy free. I wanted to share my favorite “oops it’s 5:00, what am I going to make for dinner? ?” recipe. If you can manage 5 minutes of free time, you can make this meal. It’s dye-free and my kids LOVE it. For those who aren’t familiar with stromboli it’s basically a pizza roll with sauce on the side. One of these babies feeds my family (me, hubs, 5 year old, and 3 year old) and usually leaves me some leftovers to enjoy for lunch the next day. It can easily be doubled or tripled or quadrupled if you are trying to feed a larger crowd. First, get out all your ingredients. 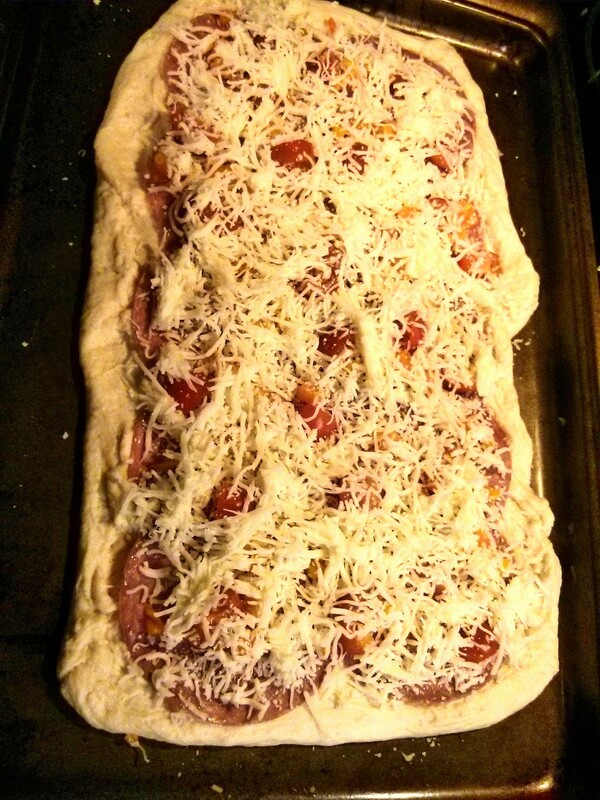 Four basic ingredients: refrigerated french bread, cheese, meat, and marinara. 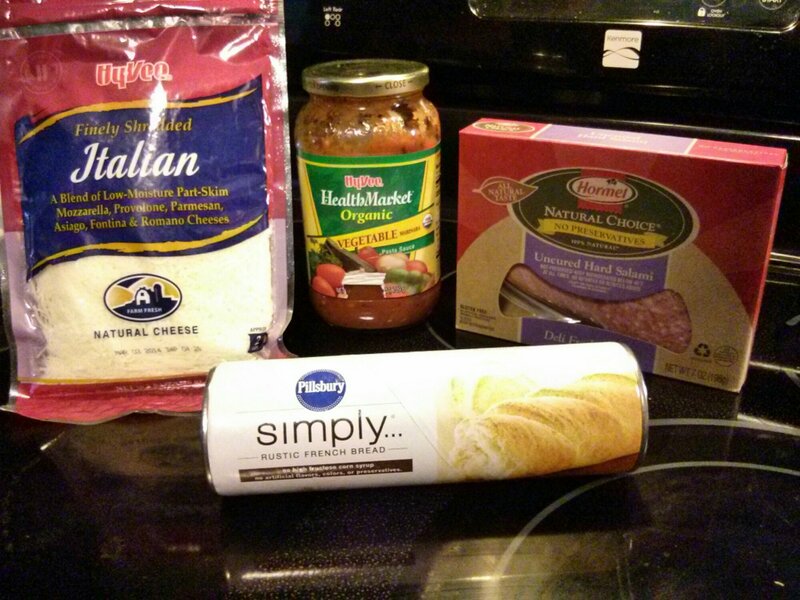 All you need to make a basic, bare bones stromboli are these four ingredients: Pillsbury Simply Rustic French Bread (you can usually find it near the cookie dough and crescent rolls at your grocery store), meat, cheese, and marinara sauce. 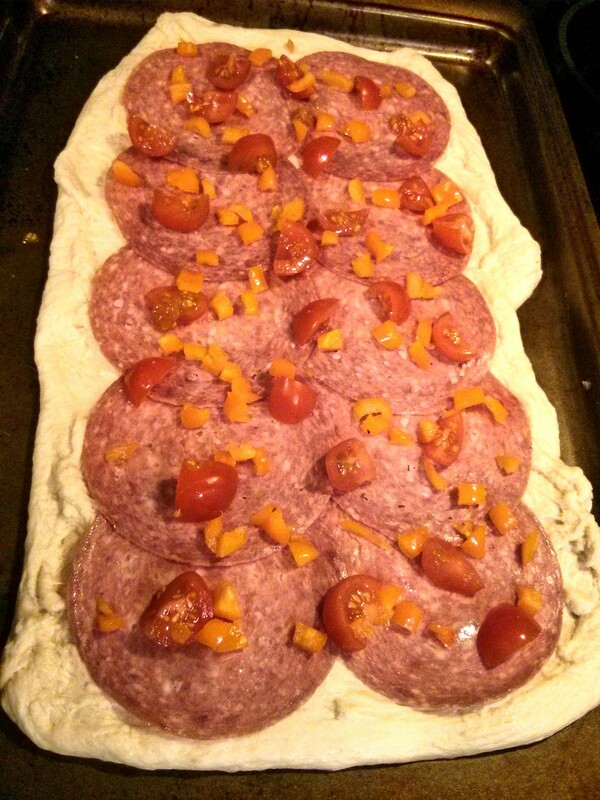 I love Hormel’s Natural Choice Uncured Hard Salami, because there are no nitrates. For information on why nitrates are bad for you read this: http://www.livestrong.com/article/283850-why-is-sodium-nitrate-bad-for-you. I have also started only buying tomato products packaged in glass containers. This is a good article explaining why it’s best to avoid canned tomatoes: http://shine.yahoo.com/healthy-living/the-7-foods-experts-wont-eat-547963.html. Finally, in order to keep this meal dye-free, make sure you only have white cheese. Mozzarella or an Italian blend works great. Any cheeses that are orange have been colored with annatto, which causes a lot of food allergies and has been linked to the same behavioral problems as other artificial colors. You need to keep a watchful eye for annatto, because technically it is a “natural” color since it is derived from plants. Things that claim to not have artificial colors or be all-natural may still contain annatto. In addition to these basics you can add veggies and spices, really whatever you want. 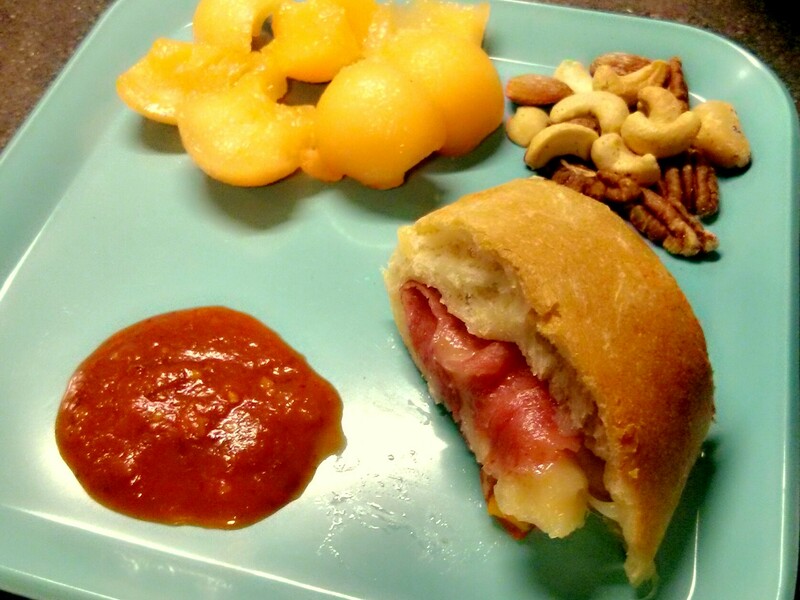 We’ve made a Hawaiian version with ham and pineapple – my husband’s favorite. You can even make it vegetarian if you take out the meat. Alright, you get it, it’s a versatile recipe. Moving on. 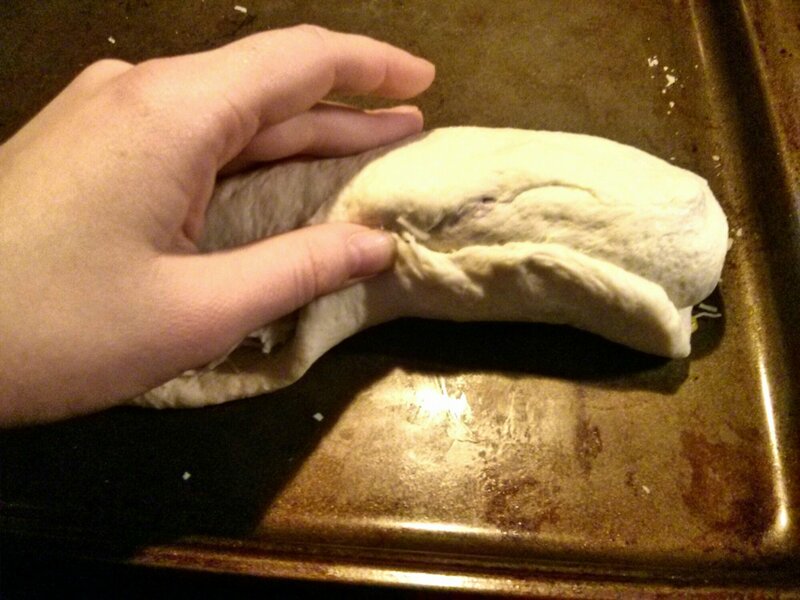 Pop open your French bread and lay it on a greased cookie sheet. 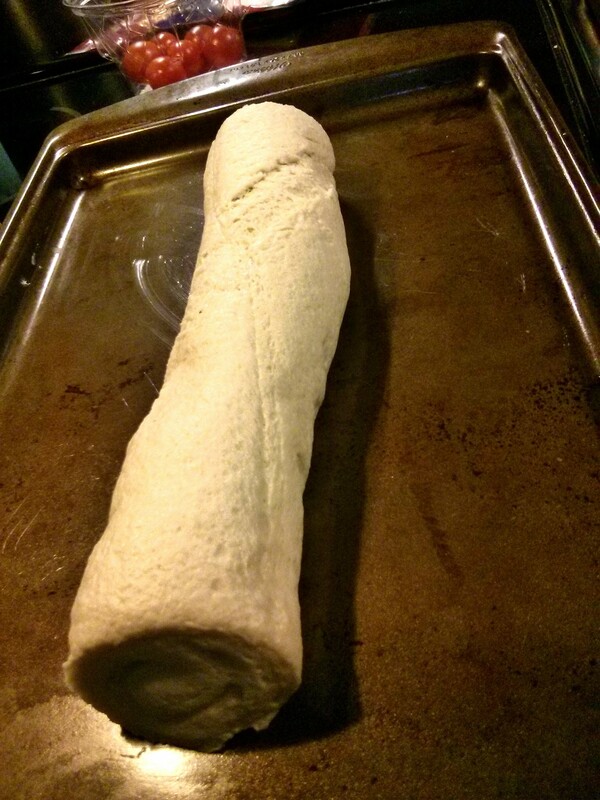 Lay out your refrigerated Pillsbury Rustic French Bread. Put your fingers in the middle of the roll and gently pull it apart. You want to flatten it out. Keep working it until it covers most of the tray. Try not to pull to hard and make holes in the dough. Tip: The dough is easier to work with if you let it warm up on the counter for 20 minutes or so before you start. Pull the roll towards the sides of the cookie sheet to flatten it. Now to start assembling. You can do this in any order you like. This is how I do it. Meats first. 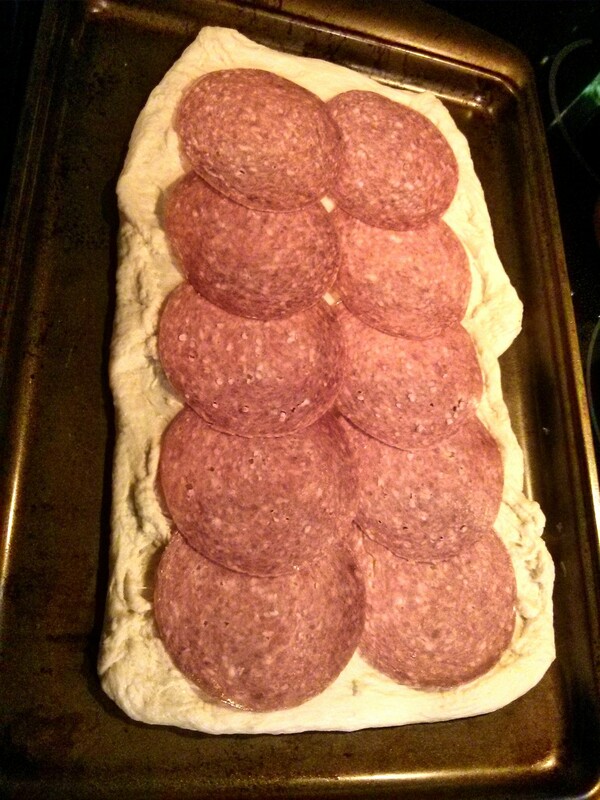 Put down some of Hormel’s Uncured Hard Salami. Next some chopped veggies. I used bell peppers and cherry tomatoes this time. Add some chopped bell peppers and tomatoes. Then the cheese. I only used about half the bag (roughly 1 cup). Sprinkle on some cheese. For dye-free don’t use any orange cheese with annatto. Now the fancy part. Start rolling! You want to roll long side to long side. Be gentle! You don’t want any holes in your dough. Keep rolling! Be careful not to make any holes the dough. 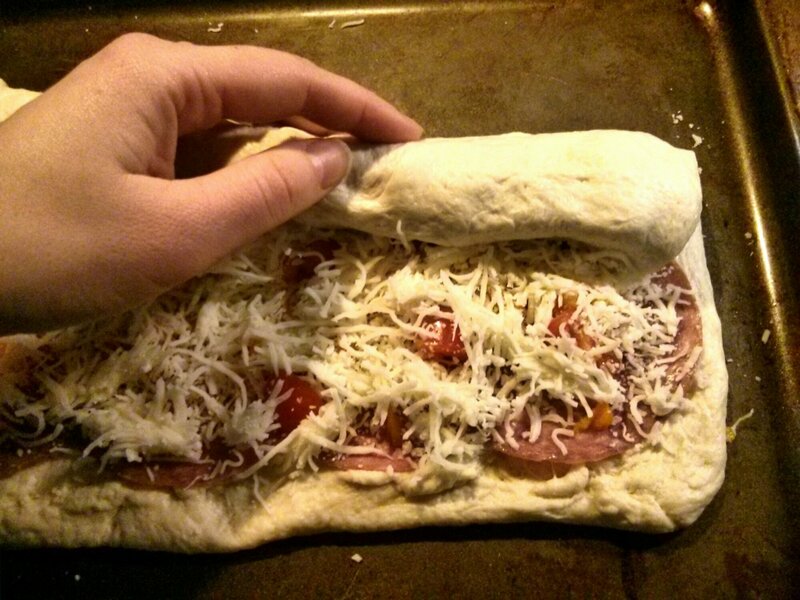 This can get tricky if you’ve overloaded your stromboli with toppings; just something to keep in mind. Once you get it all rolled up, start pinching the edge to the rest of the roll to make a seam. Seal up the edge and lay it seam down. When it’s all sealed off carefully lift the whole thing and place it seam side down on the cookie sheet. Then pinch together the ends and tuck them under the roll. 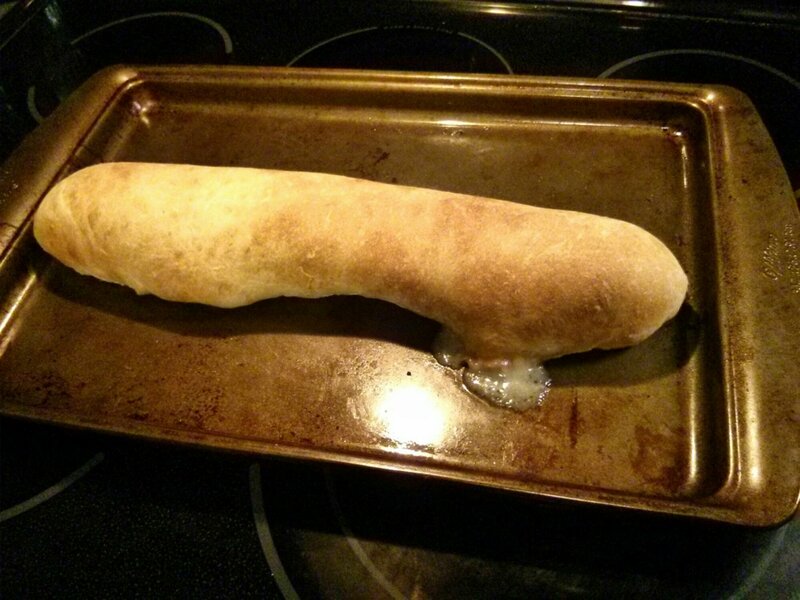 Your stromboli should look like this. 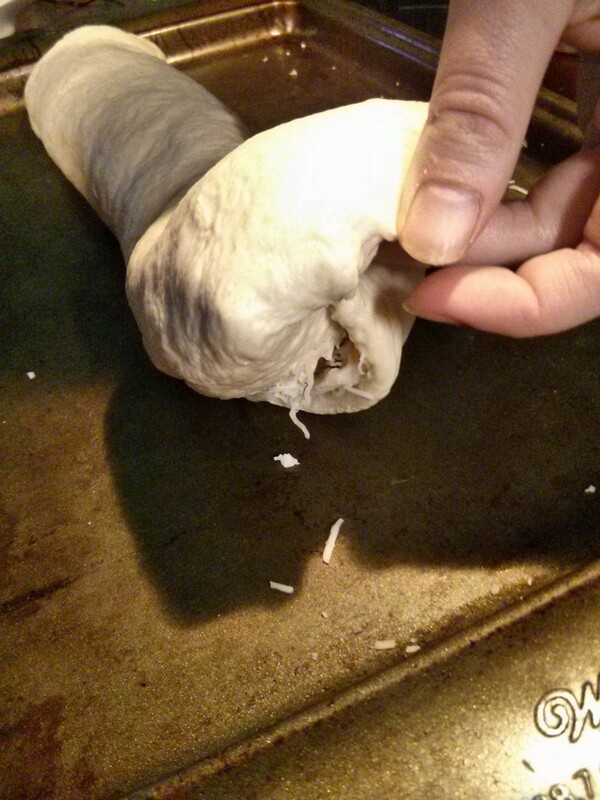 Pop your stromboli in the oven for about 20 minutes. Throw it in your preheated oven at 350° for 20-25 minutes, until it is a light brown like this one. This one leaked a little bit, which is fine, it just means I didn’t get the seam sealed as tightly as I should have in that spot. It’ll taste the same, so don’t worry. 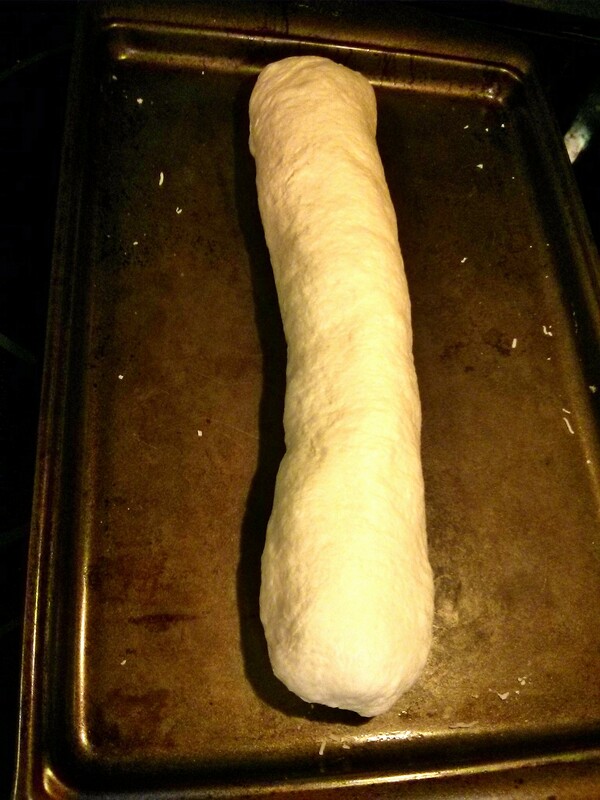 Now slice it up, and serve it with the marinara on the side for dipping. I try to add in a little more nutrition with some easy sides, like this cantaloupe I already had cut up and a handful of mixed nuts. That’s it. A delicious 30 minute dye-free meal your kids (and you) will devour. And it only took you about 5 minutes to throw together. Win! 2. 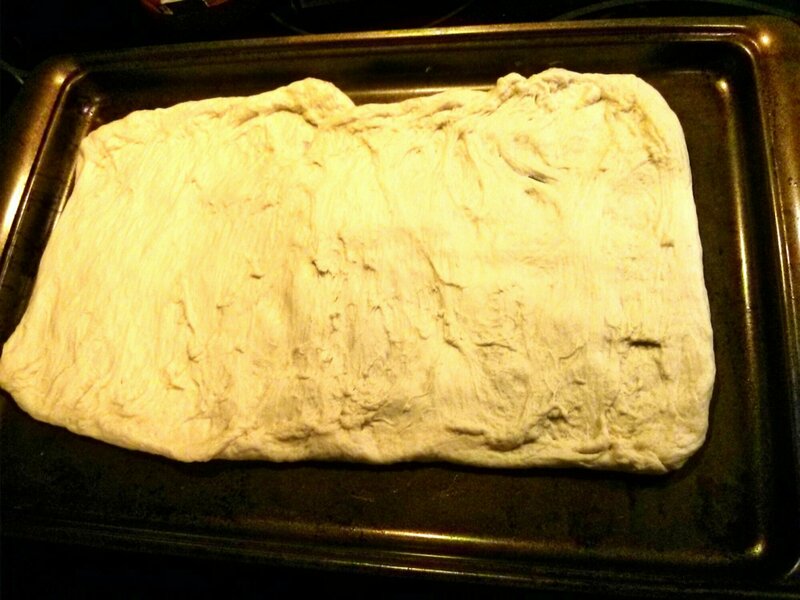 Spread out refrigerated bread dough on a greased cookie sheet. 3. Pile on cheese and toppings. 4. Roll up the dough from long side to long side, being careful not to rip holes in the dough. 5. Pinch the edge to form a seam. 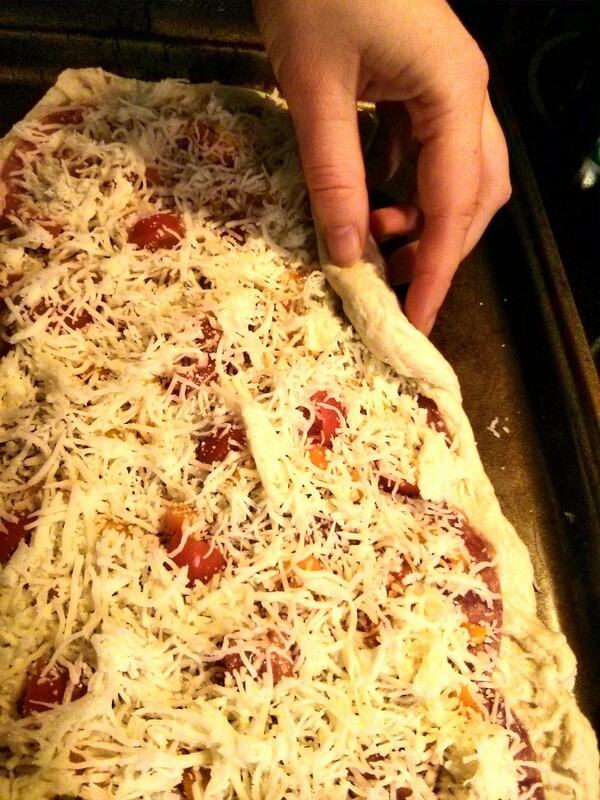 Lay the stromboli seam side down on the sheet. 6. Tuck the ends under the roll to seal them. 7. Bake for 20-25 minutes, until light brown. 8. Cut up. Serve hot with marinara sauce on the side for dipping.